Red Lips for 24 Hours? 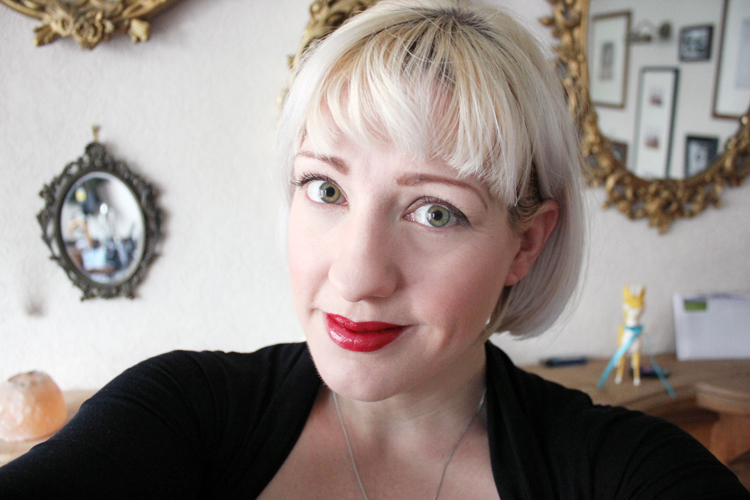 I’ve been wearing Maybelline 24hr SuperStay Lip Color for a long time. But it occurs to me that I’ve never reviewed it. So today I intend to fix that issue. When I first started wearing it I think it was called 18 hour lip color, but since they’ve evidently refined the formula so now you can get a whole extra 6 hours of it. Not that I’ve ever tried to wear it for a whole 18, or 24 hours, but I can tell you right away that my biggest problem with this lipstick is that I can’t get the blooming stuff off my lips. The particular colour I am reviewing today is called Cherry Pie. It’s a nice deep red colour, I also have Red Passion, which is a more true red colour. MEET THE LIPCOLOR THAT STRETCHES THE LIMITS OF LONGWEAR AND LASTS UP TO 24HR. I mostly wear this for Roller Derby, for games I skate in red lipstick, because I’m a tart, and this is just perfect as no matter how many shoulders I end up with mushed into my face it doesn’t come off on either me or them. In fact the biggest pain is trying to get it off properly afterwards when I wash my sweaty face! 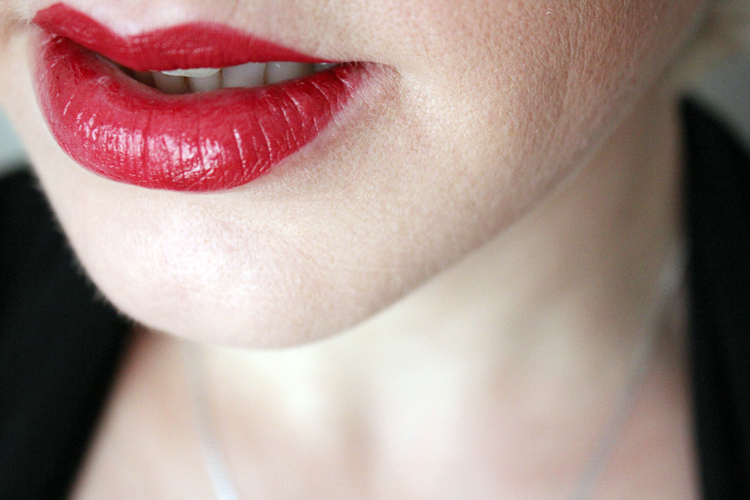 I also found it great as a base for the glitter lips I did at Christmas, which I will do a tutorial for as soon as I sound less coldy on video, and it’s good to layer under my regular red lipstick if I want it to last longer. Basically Maybelline do not lie when they say this is long wearing, it is. The shape of the applicator is really good and it’s easy to get a nice precise lip line with it, and the clear top coat gives a nice glossy finish that is really moisturising and not at all sticky. Maybelline do not tell the entire truth. The lipstick is slightly drying, though as long as you keep that top coat with you, you won’t really notice it. I also find that it does feather into the fine lines around my lips when I’ve been wearing it a long time. No one will notice unless they get right up close, but I notice. If I’m going to pick on the packaging it would be that white is a bad colour for something you’re going to carry around in your handbag, it can look grubby quite quickly and picks up marks in your make up bag. If you have a beautiful clean make up bag that no eyeshadows have ever broken, or eyeliners have lost their lid in, then it won’t be a problem, but if, like me, your make up bag is essentially lined with the death throes of all your old eyeliners and lipliners and you can’t seem to get your mascara wand back in the tube without scraping it all down the outside, then it’s going to look grubby. The biggest pain with the application is that when it says “wait 2 minutes for the colour to dry” it really means it, and 2 minutes is a long time to wait. You can’t pop this on as you rush out the door, you need to apply, then sit there and try not to talk or get it on your teeth until it’s completely dry. If you put the top coat on too early and it’s not properly dry then it removes some of the colour, you end up with patchy lips and have to wipe off the top coat and start all over again. 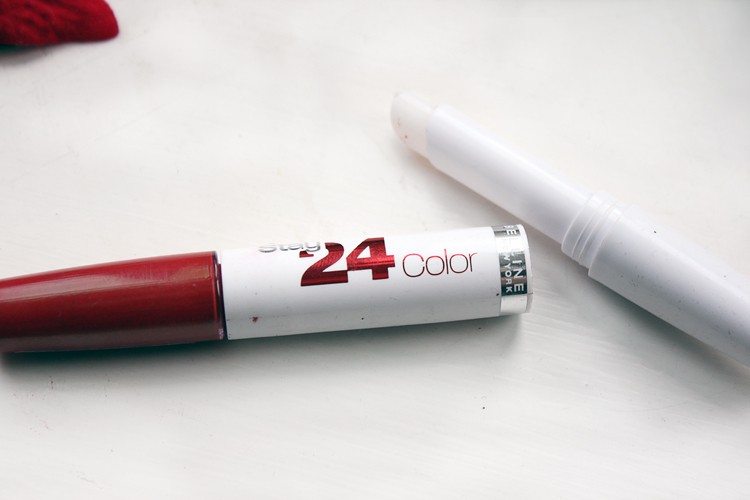 I think 2 minutes is worth the wait, considering how long it lasts, I tend to put it on, then go back and finish off the rest of my make up before applying the top coat, but if you’re horribly impatient and can’t possibly spare that sort of time this might not be the lipstick for you. You do need to use the attached top coat with it. You can’t replace it with something like vaseline as the oils start to remove the lipstick, this can be a bit of a pain if you run out of top coat before lipstick, or manage to break it, which I’ve done in the past. 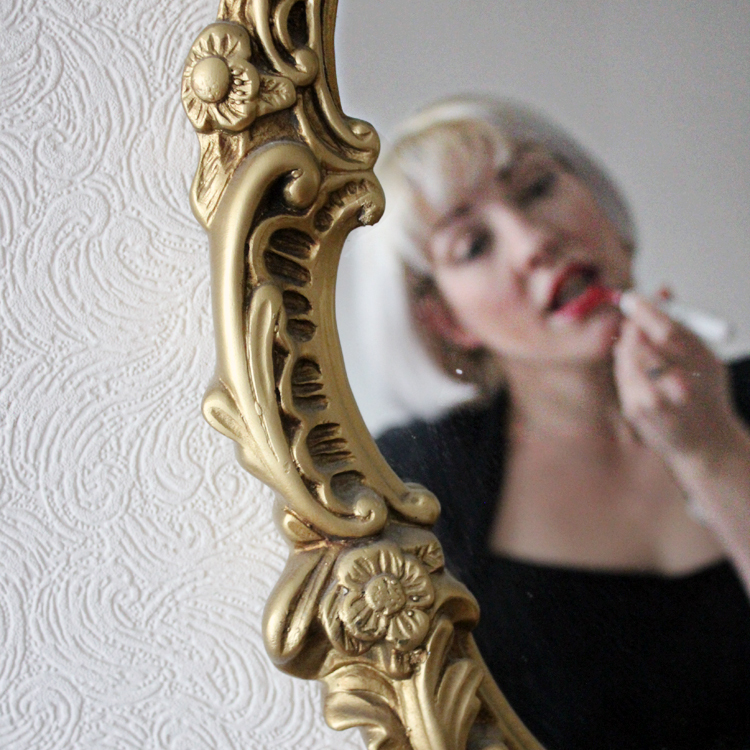 As you might have guessed by the fact that I said I’ve been wearing it for years, I really like this lipstick and would whole heartedly recommend it to anyone. It’s easy to apply, though you need a bit of patience, and will easily last a whole day. It doesn’t come off on glasses, straws, or people. To get the stuff off I recommend using an oily cleanser, at home I use coconut oil, on the go vaseline will remove it too, though you’ll need to really scrub or you end up with patches stuck to your lips! I’ve only ever tried the reds, but I notice they do have some nice pinks that I might pop in my basket next time I’m shopping as well. 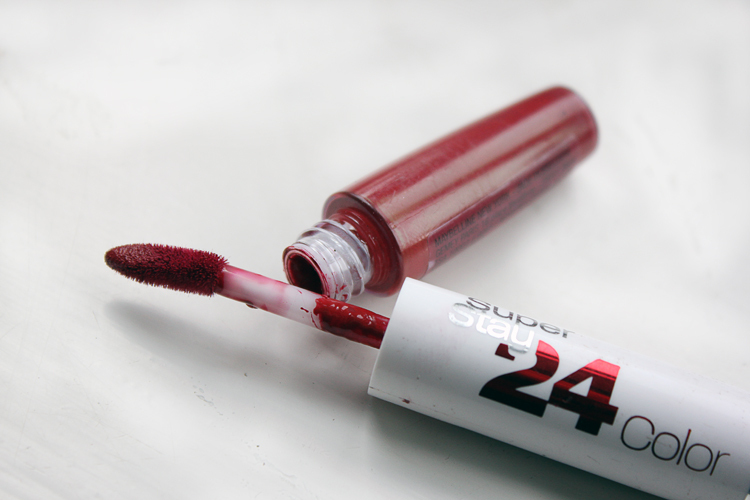 Maybelline SuperStay 24hr Colour is available from Boots at £8.99, they currently have a buy one get second half price offer on Maybelline cosmetics. I wear the vintage puppies I got from you (brand and colour now gone of the bottom of them all). I am running low too.. I wear the deep red and the bright red. Do any of the maybelline ones match or near match the colours of those two? I think this one is kind of similar somewhere between the red velvet and the cherry red. I’ll have to try and swatch them for you. Which was the bright red? I don’t think I still have that myself. I’m terrified of my Besame lipstick running out as I don’t know where to get it now! Yes I meant the Besame lippies. I swear by them. Panicking as they are getting a bit lower in the amount of them I have left. The red velvet I wear all the time. The other cherry red for going out. Yeah, that’s my problem, too impatient and if you don’t let it dry it goes patchy when you put the top coat on! I always have problems with red lipstick staying put longer than 30 minutes.. GRRRRRR BUT Love a good red with a blue undertone. You won’t with this one!